Lindsey Graham is yet another stellar example of a RINO (Republican In Name Only). He has made Marine Vet For Freedom’s Oath Breaker list. But don’t let my words here alone sway you, let’s take a look at his record as a Senator. He voted a yes on reauthorizing FISA. What is FISA? It authorizes the intelligence community to obtain relevant and pertinent information about certain individuals from an electronic communications service provider. Mind you, without a warrant. Anyone see how dangerous something like this can be? He is also responsible for a “yea” vote on the National Defense Authorization Act (NDAA), including the provision that allows for the indefinite detention of persons deemed enemy combatants (which could include American citizens on American soil). The definition of an enemy combatant is left up to Department of Homeland Security and the Department of Defense. He voted against an amendment to the NDAA that would prohibit US Citizens from being included under the indefinite detention clause. Senator Graham has also been pushing for “amnesty” for what is estimated to be 11+ million illegal immigrants. This would devastate the economy and weaken our national security. He also voted to extend the PATRIOT Act, which violates numerous amendments in the Bill of Rights. 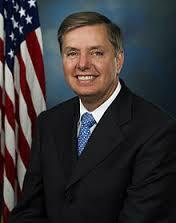 Senator Graham will be up for reelection in 2014. Let’s get someone who remembers what the United States Constitution is, and get rid of another senator who will compromise with progressives hell bent on destroying America. Although the editor of shaynroby.com has mixed emotions about the surveillance capabilities that should be given to the NSA and other agencies as a result of the Patriot Act and NDAA, this publication without question opposes amnesty for the millions of illegal aliens who currently reside in the United States. It is the Constitutional duty of law enforcement to deport individuals who are here illegal when aware that this is the case, regardless of what Barack Hussein Obama, or the Kangaroo Court known as SCOTUS says. I can agree with that statement. He certainly doesn’t act very American with much of what he does. Doesn’t appear good. At least he’s standing up for the families and survivors of Benghazi, attempting to get testimonies on the record. No ones else seems to have the balls. I will give Senator Graham that much, but not really much else. I find it odd that someone who can be so right on one issue, could be so terribly wrong on so many others.